This display system is the strongest, most durable available on the market today. The patented lightweight frame expands easily, securely locking for an incredible load-bearing strength of 750lbs. 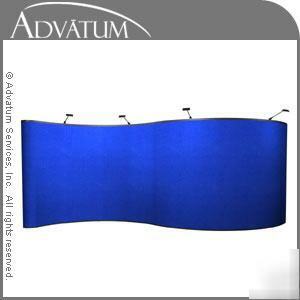 This ensures a stable, professional-looking backdrop with no fabric buckling. Engineered for a lifetime of use and constructed only from high grade materials, this system's second-to-none quality is backed by a guarantee of your full satisfaction. It takes one person approximately twenty to twenty-five minutes to fully set up this booth. No tools are required; with clear, easy to follow instructions provided. How Does This Booth Compare To Others? Worse yet, they can fail to meet show safety regulations and disallowed as an exhibit. This fact is not readily disclosed by 'bargain' sellers, but one we often hear from businesses needing to replace their system with a better quality. Please read our Quality Review to learn more about what youâ€™re getting. We exclusively sell online, skipping middlemen to partner directly with only quality manufacturers in large volume. This avoids traditional costly overhead, ensures product satisfaction, allowing for a price far less than what you would pay through a regular dealer.